Build BI Solutions with the World’s Favourite Modelling Tool. BIReady’s Data Warehouse Automation software helps drive down costs and speed up your Data Warehouse development projects. BIReady's Model-driven Data Warehouse generation engine takes care of the hard work for you using best practices and a stable architecture that you can manage and tweak with ease. The BIReady CA ERwin® Package solves this problem by generating a target data warehouse design and the code to populate it in minutes—all from within CA ERwin® and all from the ERwin-generated model of the data sources. The BIReady CA ERwin Package represents the distillation of industry best practices into a single product. Taking your source data models, BIReady uses Inmon’s approach in creating a Third Normal Form model for your data in minutes. BIReady also creates Data Vault structures to preserve ‘history-of-history’ - vital for understanding the state of your data at any given point in time. All code is generated in your preferred SQL (Microsoft, Oracle, DB2, MySQL, Teradata, Netezza, etc.) and is ready-to-run in seconds. Finally, BIReady generates Kimball Star-Schema structures from your data for true self-service reporting using your favorite Business Intelligence software. All this is done very quickly—typically crushing months of work into just a few days. - See more at: http://erwin.com/partners/oem- solutions/biready/#sthash.Kdjl8mnZ.dpuf Book a demo today and we’ll show you what successful BI looks like. 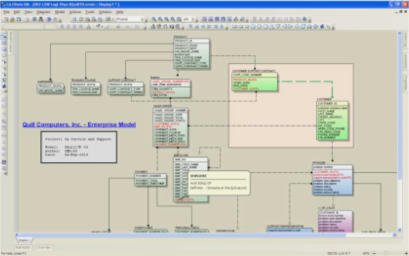 CA ERwin Data Modeler allows you to manage complex data structures in an intuitive, easy-to-use graphical interface. BIReady’s Data Warehouse Automation software helps drive down costs and speed up your Data Warehouse development projects. BIReady's Model-driven Data Warehouse generation engine takes care of the hard work for you using best practices and a stable architecture that you can manage and tweak with ease. The BIReady CA ERwin® Package solves this problem by generating a target data warehouse design and the code to populate it in minutes—all from within CA ERwin® and all from the ERwin- generated model of the data sources. The BIReady CA ERwin Package represents the distillation of industry best practices into a single product. Taking your source data models, BIReady uses Inmon’s approach in creating a Third Normal Form model for your data in minutes. BIReady also creates Data Vault structures to preserve ‘history-of-history’ - vital for understanding the state of your data at any given point in time. All code is generated in your preferred SQL (Microsoft, Oracle, DB2, MySQL, Teradata, Netezza, etc.) and is ready-to-run in seconds. Finally, BIReady generates Kimball Star-Schema structures from your data for true self-service reporting using your favorite Business Intelligence software. All this is done very quickly—typically crushing months of work into just a few days. - See more at: http://erwin.com/partners/oem- solutions/biready/#sthash.Kdjl8mnZ.dpuf Book a demo today and we’ll show you what successful BI looks like.